We visited Rivendell Winery, Brimstone Hill Vineyard, Baldwin Vineyards, Brotherhood Winery, and our runaway favorite, Benmarl Vineyards. These folks are members of the Shawandunk Wine Trail, a group of wineries all on the west side of the Hudson. Now, Napa and Sonoma it ain’t, and if you’re expecting that, steel yourself with some NZ Sauvignon Blanc for a major letdown. But you can look forward to some interesting and quirky folks, and some really good and really, uh, less-good wines that have somehow managed to find an audience. I think. You’ll find reviews of some of these wines in the Quick Tasting Notes section of this website. 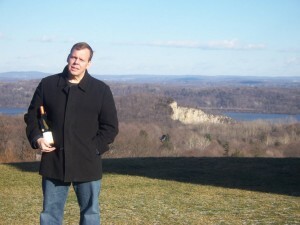 And we’ve more New York wineries to explore in the spring, including those out on Long Island, but for now you might find these tour notes useful. 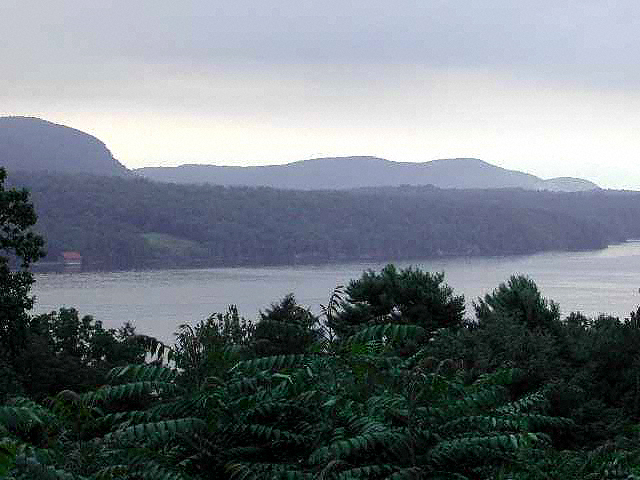 You approach Benmarl up a long, unpaved road and when you first get to the property, it’s attractive but seems like nothing special, until you walk toward the Hudson River overlook and realize how beautiful the view, even on a frigid January day. We spent about two hours in the tasting room, trying an impressive array of wines. 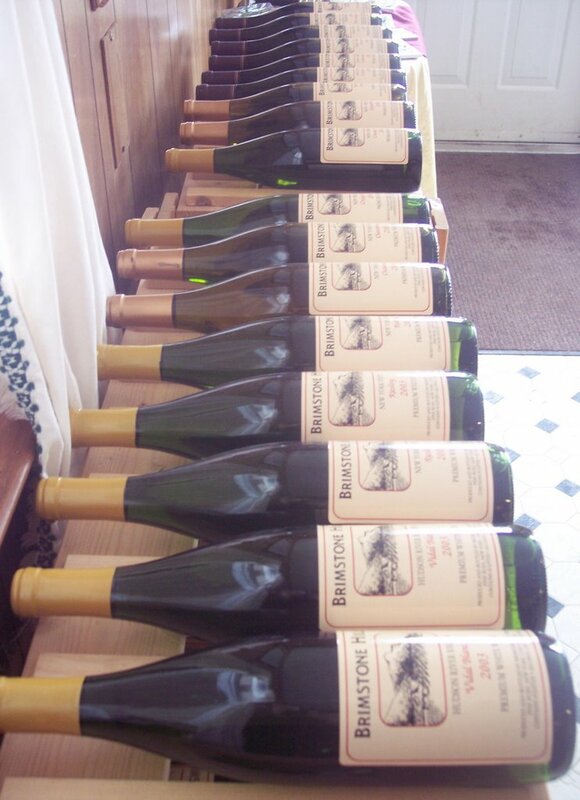 Although they are all fermented, aged and bottled at the winery, the grapes or juice for many of Benmarl’s wines come from Oregon, Washington or California. And among them are some very good offerings, particularly the Syrah, Slate Hill White, Baco Noir, and the Sweet Sarah dessert wine made from Primitivo. See my thoughts on these and more in Quick Tasting Notes, January 22, 2007. For most of our time there we were the guests of Winemaker Kristop, who took us down to the wine library, where we saw winery selections dating back 30 years, and the barrel room, where we barrel tasted a new white blend that he’s experimenting with. I won’t tell you what’s going in it, but even in its immature cloudy state it was fresh, crisp and very promising. The wines, people and hospitality of Benmarl rival any I’ve ever visited, and I encourage you to make this you first stop. They charge a paltry $3 for a complete tasting and you walk away with a handsomely etched tasting glass, too. In my case I also left with, well, a case of assorted wines. Rivendell is a different story. 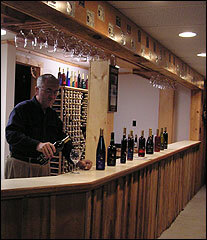 The “winery” is really a large, comfortable and modern tasting room and retail store, where you’ll find wines not only from Rivendell, but also from other Hudson Valley wineries, and an impressive selection from Long Island. Rivendell is part of Vintage New York, which also operates two retail shops in Manhattan and which are on my list to visit soon. 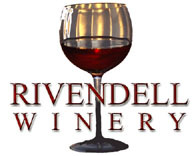 Rivendell will pour you five fairly generous tastes for $5 and they’ve got some very tasty arrows in their quiver, among them the Rivendell SoHo Cellars Chardonnay, Wagner Vineyards Meritage and my big-time favorite, the Macari Bergen Road 2001 from Long Island. The lasting room is pleasant with a large, wrap-around “back porch” and ideal for gatherings; they also have a lot of fun wine chotchkes and merchandise for sale as well as snacks to accompany your wines. But don’t expect a lot of wine knowledge or interest on the part of the staff except for “Marissa” – so ask for her. Baldwin Vineyards is located in the middle of nowhere but worth the trip to Pine Bush, New York as part of a wine tour in the Hudson Valley. We arrived precisely as the place opened at 11:30 a.m. on a frosty Sunday morning, and I think we startled Assistant Winemake Rigel (rhymes with Nigel) Byrne when we walked in the door of the converted farmhouse. Rigel, whose interest is really brewing – he’s credentialed brewmaster – was a genial host as he poured us virtually everything in the house, from a surprisingly good Brut Sparkling Wine to a lush and syrupy Strawberry Wine that we’ll be pouring over cheesecake in short order. I’d skip the dry red wines, and instead go for the Mist diGreco, a wonderful blend of Chardonnay and Seyval Blanc. See Quick Tasting Notes for January 23, 2007 for the highlights. Brimstone Hill Vineyard, was, well, an experience. The tasting room is the upper floor of a modest house, which frankly needs a makeover and a good cleaning – it’s vintage 1960s, crusty linoleum and all. Heat was provided by a portable LP-gas fed burner in the middle of the tasting room floor. Clearly a tiny family operation, Brimstone advertises “Quality wines with a French character…similar to the better products of the Loire Valley, Burgundy and Champagne.” I won’t quibble with their description other than to say that while I enjoyed and do recommend the Seyval Blanc and Cayuga White, the latter a delightful, semi-sweet number, the favorable comparison to great wine regions of the French Republic is absurdly far-fetched. My advice is, if you’re in the Pine Bush area, perhaps at Baldwin, the 5-minute drive to Brimstone is ok. 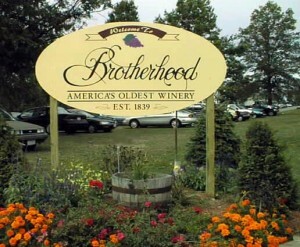 I was especially looking forward to our last stop, Brotherhood Winery in Washingtonville, NY. And I can’t tell you what a letdown it was when I actually arrived, took a look around and spent some time in the tasting room. Now, that tasting room is one of the largest I’ve ever seen, nicely appointed with several tasting counters and rows of beautiful wine-library racks stocked with selections from Brotherhood and other wineries. Unfortunately, appearances were deceiving. First, we had to wait almost a half-hour for a tasting, since the tasting staff (or on this day, the tasting staffer) are adamant about putting on a presentation and so they won’t just pour you some selections. And as I was waiting, I looked around for any sign of tasting glasses, and was horrified to see stacks of what looked like tiny urine specimen cups. Now, I drank Bourbon out of such finery when I was in the Marine Corps, on the occasion of the Corps’ birthday each year on November 10. However, I did and do expect more from the place that bills itself as America’s oldest continuously operating winery (they made sacramental altar wines under special permit during Prohobition). And I was mightily let down. Anyway, when we finally were “seen” as in a doctor’s office, the gentleman behind the counter had a lot to say but seemed to be reading from a TelePrompTer over my right shoulder. He quoted figures and accolades about various wines in a machine gun fashion, rarely stopping to catch his breath. But when I asked him a question about a Brotherhood Chardonnay, he had no idea how to respond and seemed puzzled. Despite the fact that we could not properly appreciate our selections out of tiny plastic cups, we did taste several, and unfortunately, nothing stood out. Except, that is, for the Mariage, a blend of Cabernet Sauvignon and Chardonnay, the latter from four “lost” and recently discovered barrels of an unknown vintage. I found it totally off-putting although the bottle was attractive. I understand that Brotherhood’s underground caves are huge and that they have an excellent tour, but no one seemed interested in talking to us about the tour, and the place seemed to be closing at 3:30 pm even though it’s advertised as open until 5:00. And it took some prodding to break the lady at the checkout counter away from her Star magazine just to pay for our tastings and the single bottle we purchased. Maybe this was just an off day for Brotherhood, but in my view they are far too cold and commercial, and need to get back to the basics. They can start by tossing the urine specimen cups, buying some decent tasting glasses, hiring some educated and enthusiastic staffers, and brag a bit less about being “America’s oldest winery.” In this case, oldest ain’t better.